This Georgia Rising is a study of Georgia’s political changes in the decade of the Second World War and in the postwar years of the 1940s. Georgia’s political establishment underwent challenges in the 1940s in everything from Georgians defending the state’s university system from attacks by Governor Eugene Talmadge to challenges by Georgia’s larger cities and towns to the state’s county unit system to the early postwar stirrings of the modern civil rights movement. An array of progressive forces—including Georgia’s veterans of the Second World War, college and university students, newspaper editors and reporters in the state’s larger circulating newspapers and smaller town newspapers—fought for change in some of the state’s political institutions, culminating in the 1942 election of Governor Ellis Arnall and in 1945 the changes to the state constitution. This Georgia Rising is a detailed study of the gubernatorial races of the 1940s as they are interwoven with the larger political and social changes of wartime and then postwar Georgia. This book draws not only from Georgia’s larger circulation newspapers but also focuses on its smaller circulation newspapers and especially its African-American newspapers, including The Atlanta Daily World and The Savannah Tribune. 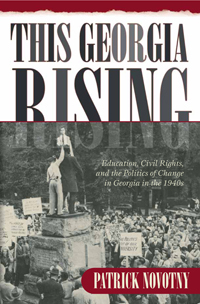 This Georgia Rising offers a detailed and rich narrative of a decade of far-reaching change in twentieth-century Georgia.